This week the Language Variation & Change workshop is pleased to host Jack Martin from the College of William and Mary. He specializes in the documentation of numerous native languages of the American south. You can learn more about his work here. I hope you can make it, especially if you have any interest in fieldwork or documentation! Collaboration between linguists and endangered language communities often requires a delicate balance between projects that the community wants and research that linguists want to conduct. Dictionaries are one promising area where linguistic research is seen as having a beneficial impact on the community. This paper reports on another type of project: an oral history project requested by the Seminole Nation that informs us of ongoing variation and change in language (see http://muskogee.blogs.wm.edu/interviews/). The first part of this paper discusses the mechanics of our oral history project: working with the Seminole Nation and listening to their needs, obtaining funding, scheduling interviews, transcribing and translating files, and file management. The second part of the paper discusses some of the discoveries we are finding about modern spoken Muskogee (and language obsolescence): a) the emergence of a new conjunction ton; b) the surprisingly widespread use of what Haas called “women’s speech”; c) apparent decline in control of numbers; d) use of English hesitation words; and, e) previously undescribed contractions. We will also discuss the ways that oral history projects can be used in linguistics and other fields. 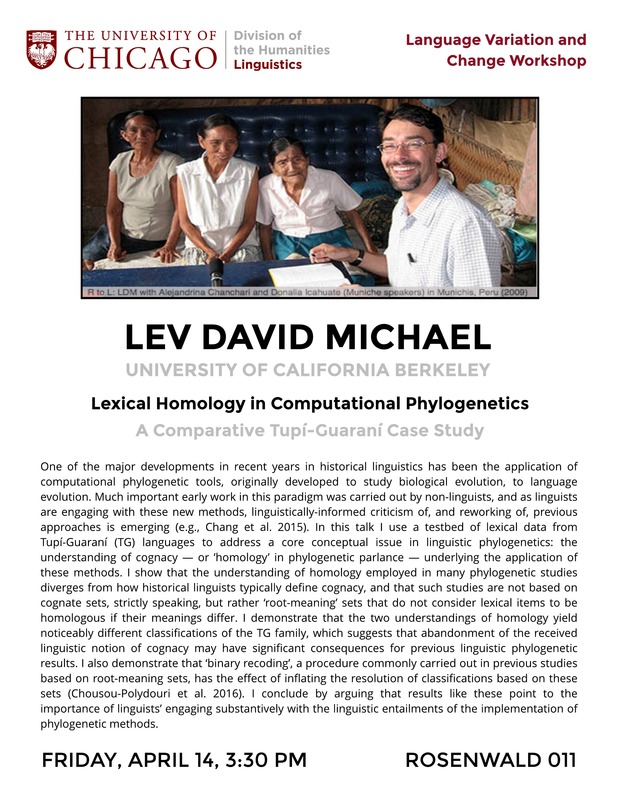 Please join us for a talk by visiting speaker Lev Michael of the University of California Berkeley. The talk will be Friday, April 14th at 3:30 PM in Rosenwald 011. Refreshments will be provided. Hope to see you there! 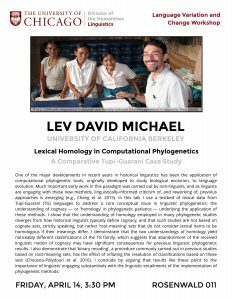 Please join us this Friday, February 24th at 1PM in Rosenwald 208 for a joint meeting of LVC and the Morphology & Syntax workshops. Our speaker will be Adam Singerman. Tuparí (Tupían; Brazil) has innovated a finite embedding construction that bears the structural hallmarks of an internal headed relative clause. What makes this construction typologically unusual is that it instantiates an apparent violation of the Final-over-Final Condition (a proposed universal discussed at length in recent work by Biberauer, Holmberg, Roberts, and Sheehan): the Tuparí configuration shows a left-branching syntactic projection dominating a right-branching one. This talk will present the main descriptive and analytic generalizations concerning finite embedded clauses in Tuparí and will examine the implications for current theories of syntactic disharmony: Biberauer et al’s FOFC and Hawkins’s Performance-Grammar Correspondence Hypothesis. In particular, I will show that the Tuparí facts are more problematic for the PGCH than for FOFC (even if FOFC’s appeal to innate constraints in UG is not fully satisfactory as an explanatory mechanism). The talk concludes with an examination of the origins of finite embedded clauses in Tuparí. While such clauses transparently involve the grammaticization of a demonstrative third person pronoun as a clausal subordinator, there is evidence that the backwards syntactic dependencies visible in direct quotation have also played a role. NOTE: The location of this talk has changed! It will now take place in Foster 505. LVC is very pleased to welcome Denny Moore, who is here for a CLAS workshop, Linguistic and Other Cultural Exchanges across Brazilian History, and has graciously agreed to talk to us about his extensive fieldwork in Brazil. Denny Moore’s talk will take place in Foster 505 on Monday, October 31st at 12 PM. Lunch will be provided. This talk will be about the situation of the indigenous languages of Brazil, their study and their documentation. These matters will be considered in the context of Brazilian scientific politics, which influence research and practical measures to benefit native groups. (It is useful for graduate students to understand the political aspects of research.) One current documentation project, supported by the Endangered Languages Documentation Project, will be described, “Encyclopedia digital of the traditional language and culture of the Gavião and Suruí of Rondônia, Brazil”. Friday October 7th at 3:30 PM: Fieldwork Recap Session Part 1! Please join us for the first part of this year’s Fieldwork Recap Session, where students will talk about where in the world they’re conducting their research and the challenges associated with working and establishing contacts in different places. Our first group of presenters (along with the regions where they work) includes: Adam Singerman (the Amazon), Ksenia Ershova (the Caucasus), Perry Wong (Guatemala), and Jessica Kantarovich (Siberia). 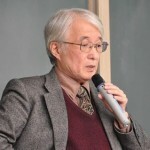 Yukinori Takubo (Kyoto University) at LVC on Tuesday, March 1st! endangered languages. Just like a real museum, the digital museum proposed here consists of (1) a storage space, where items are archived, and (2) an exhibition space, where a selection of items from the storage are exhibited. Currently, in language documentation and conservation, the archives and the web pages are treated separately. Language archives are created mainly for the purpose of storing language data permanently for future reference. The web spaces for language conservation or exhibition are usually constructed without direct reference to the archived data. Our proposed system enables us to construct a digital space for endangered languages linked to a large-scale archive at an individual level and at a manageable price, thereby providing us with a powerful tool for language documentation and conservation.